Australian Flight Sergeant Norman Francis Dougald McCallum died on 29th November 1943 and is buried alongside fellow crew members in Lisburn, Co. Antrim. Flight Sergeant Norman Francis Dougald McCallum was on board Lockheed Hudson AM694 when it crashed on a training exercise over the Co. Antrim countryside after simulating a bomb drop on Lough Neagh. Flight Sergeant Norman Francis Dougald McCallum (418001) served in the Royal Australian Air Force during World War Two. He was attached to RAF No. 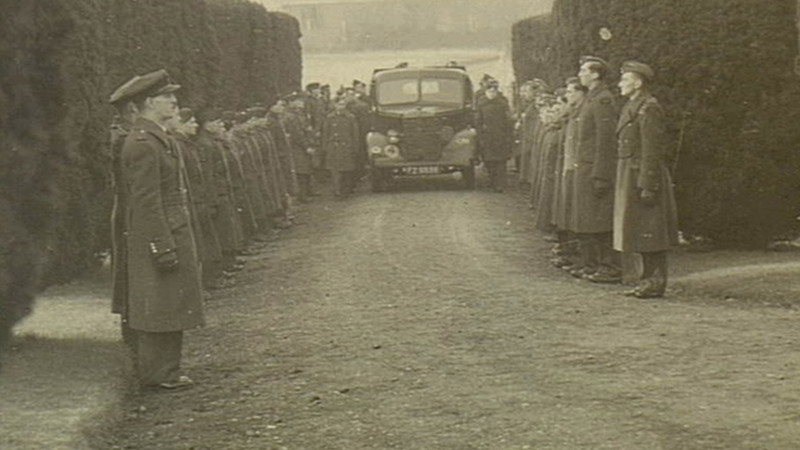 5 Operational Training Unit at the time of his death in November 1943. Born on 1st November 1920, he was the son of George Richard McCallum and Mary Isabella McCallum, of Wallacedale, Victoria, Australia. Norman died on 29th November 1943 aged 23 years old. He enlisted in the Royal Australian Air Force on 24th April 1942. Before enlisting, he was a labourer in his hometown of Wallacedale. Back Row: 1. Aircraftman 2nd Class George Thomas McGrath, 2. Aircraftman 2nd Class Colin George Lecornu, 3. Aircraftman 2nd Class Robert Henry Mableson, 4. Aircraftman 2nd Class Arthur Gordon McInnes, 5. Aircraftman 2nd Class Edward Robert Mitchell, 6. Aircraftman 2nd Class Bruce Cecil Marsden, 7. Aircraftman 2nd Class Bruce Moller, 8. Aircraftman 2nd Class Kevin Pierre Murphy, 9. Aircraftman 2nd Class Gilbert Owen Hugh Lind, 10. Aircraftman 2nd Class Eric Reginald Harry Murphy, 11. Aircraftman 2nd Class Ian Ibenthal McDonald, 12. Aircraftman 2nd Class John Davey Norgard. Middle Row: 1. Aircraftman 2nd Class Bryant Thomas Marshall, 2. Aircraftman 2nd Class Owen Joseph McKenna, 3 Aircraftman 2nd Class Berry Gordon Medway, 3. Aircraftman 2nd Class Herbert Keith Newbury, 4. Aircraftman 2nd Class Owen Brakspear Morgan, 5. Aircraftman 2nd Class Bruce Malcolm Mackie, 6. Aircraftman 2nd Class John Leonard Henry Lindon, 7. Aircraftman 2nd Class Blair Sinclair Moody, 8. Aircraftman 2nd Class Henry William McMahon, 9. Aircraftman 2nd Class William Eric Lynch , 10. Aircraftman 2nd Class Howard Greenfell McLaren, 11. Aircraftman 2nd Class Jeffery Raymonde Potter Medwell. Front Row: 1. Aircraftman 2nd Class Gordon Kerr Menzies, 2. Aircraftman 2nd Class Alfred Midwood, 3. Aircraftman 2nd Class Kenneth Verdun Millar, 4. Aircraftman 2nd Class Colin Hillier Martin, 5. Aircraftman 2nd Class Raymond Lewis Merrill, 6. Aircraftman 2nd Class Charles Bruce Matthew, 7. Corporal William John Francis Strudwick, 8. Aircraftman 2nd Class Albert Gordon Lean, 9. Aircraftman 2nd Class John Keith McDonald, 10. Aircraftman 2nd Class Walter Hector Morrison, 11. Aircraftman 2nd Class James Alexander Mitchell, 12. Aircraftman 2nd Class Norman Francis Dougald McCallum, 13. Aircraftman 2nd Class Mervyn Thomas Lee. Australian War Memorial Photo: P01405.034. 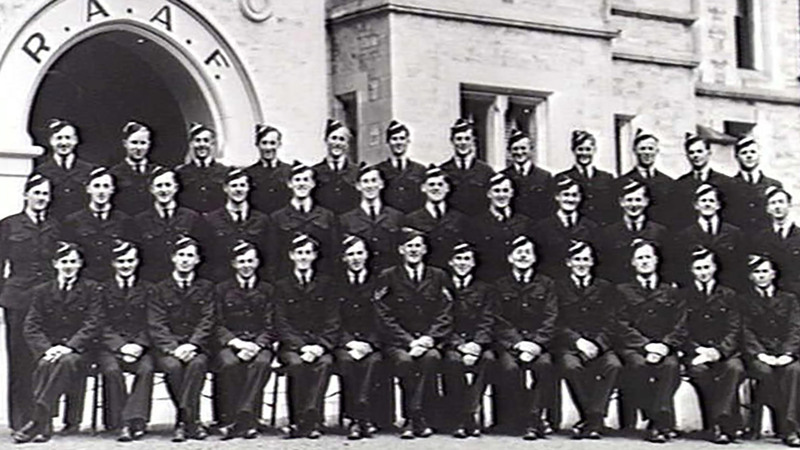 Group portrait of No 4 Service Flying Training School, RAAF, Course No 27, B Squadron, Flight 13. Copyright Frank Boase. He was a wireless operator/air gunner on board Lockheed Hudson AM694. The crew took off from RAF Long Kesh, near Lisburn, Co. Antrim at 1520hrs on 29th November 1943. The non-operational flight was a bombing exercise over Lough Neagh. At 1609hrs, the Australian crew completed their task but proceded towards Templepatrick, carrying out a series of steep turns over Loughermore Estate near Dunadry, Co. Antrim. They were due to return to base and this section of the flight was unauthorised. During one of these turns, the pilot throttled back both engines and the plane lost height rapidly. The engines stalled and the port wing struck the ground. The Hudson burst into flames and all those on board died in the impact. Australian War Memorial Photo: SUK11632D. A guard of honour forms for the funeral of Flight Sergeant Norman Francis Dougald McCallum (418001) at Eglantine Church of Ireland, Lisburn, Co. Down. Photo taken on 3rd December 1943. Australian War Memorial Photo: SUK11632A. 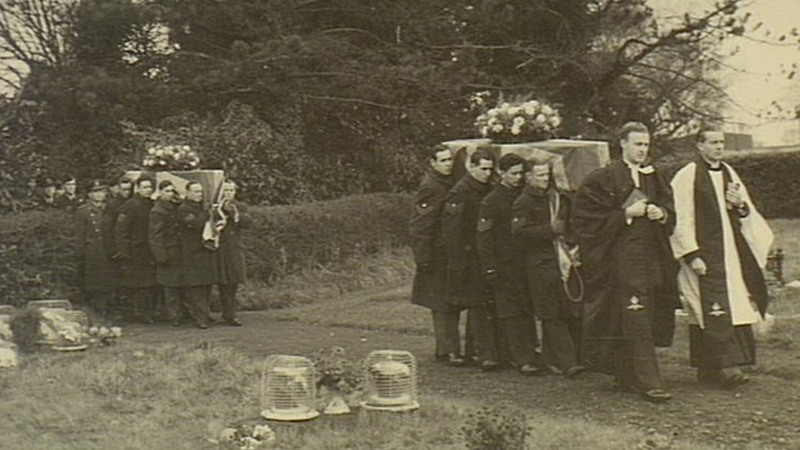 The funeral of Flight Sergeant Norman Francis Dougald McCallum (418001) at Eglantine Church of Ireland, Lisburn, Co. Down. Photo taken on 3rd December 1943. Keane John Russell Flying Officer Pilot RAAF 409839. Connell Francis Aloysius Flying Officer Navigator RAAF 421168. Mullins William Murray Flight Sergeant Wireless Operator/Air Gunner RAAF 418542. McCallum Norman Francis Dougald Flight Sergeant Wireless Operator/Air Gunner RAAF 418001. Australian War Memorial Photo: SUK11632B. Airmen from RAF Long Kesh carry the coffin of Flight Sergeant Norman Francis Dougald McCallum (418001) and an unknown airman to the graveside at Eglantine Church of Ireland, Lisburn, Co. Down. Photo taken on 3rd December 1943. For God, for King and country. Greater love hath no man. ANZAC airmen John Russell Keane, William Murray Mullins, and Francis Aloysius Connell also died in the same aviation accident. Australian Flying Officer John Russell Keane was flying with No. 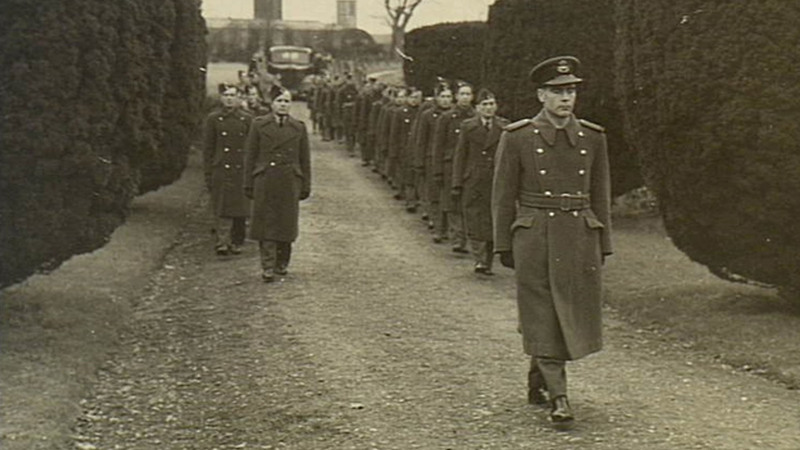 5 Operational Training Unit from RAF Long Kesh, Co. Antrim when he died in November 1943. Flying Officer Francis Aloysius Connell served in the Royal Australian Air Force with attachments to the RCAF and RAF before his death in November 1943. Flight Sergeant William Murray Mullins served with RAF No. 5 Operational Training Unit when he died on 29th November 1943 in an air crash over Co. Antrim. If you enjoyed this post on "Norman Francis Dougald McCallum", please share with your friends and followers.